In June DataSpace UK Ltd exhibited at Pulse Live Manchester. Pulse Live Manchester is a two day event arranged and hosted by Pulse Today the publication for GP’s, Practice Managers and those providing primary care. DataSpace are proud to provide Patient Note Storage and Management services to Medical Centres and Practices. DataSpace’s Patient Note solutions streamline Practice’s internal procedures, meet NHS Information Governance and CQC requirements and enable Practices to utilise their work environment much more effectively e.g. provide additional clinics. DataSpace provided delegates with the opportunity to win a brand new 7″ Kindle Fire HD Tablet just by filling out their details and entering our Prize Draw. Debbie Coombes – Practice Manager of Dr Wadsworth & Partners Practice. When I told Debbie that she was the lucky winner of DataSpace’s Prize Draw, Debbie was in complete disbelief. I delivered Debbie’s Prize in person and she was truely over the moon and the cherry on top of the cake was to also receive a few additional DataSpace goodies including; DataSpace pens, post-it notes, coasters and Trolly Coin Keyrings. 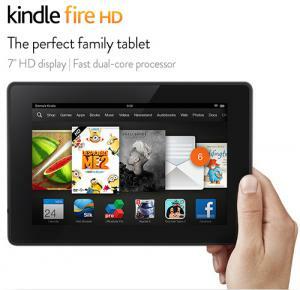 From everyone at DataSpace well done Debbie and we hope you enjoy your Kindle.